Shippers oversee complex supply chains that move 16 billion tons of freight around the country every year. Beyond coordinating their inventories and loads, shippers move their freight through hundreds of facilities. Process and speed at these facilities vary widely, especially during high-volume seasons when freight is surging due to demand. While many facilities help drivers get unloaded, loaded, and back on the road quickly, others are backlogged and result in several hour wait times. If shippers had direct visibility into inefficiencies like this, they would be empowered to make changes to improve both their operations and reputations — but that kind of actionable data isn’t readily available. At Uber Freight, we aim to give shippers more transparency into their supply chains. Now, we’re sharing quantitative insights with our shippers through a new analytics tool, Freight Insights, available directly within our existing shipper platform. With Freight Insights, shippers can see their unique data laid out in a useful and actionable format. 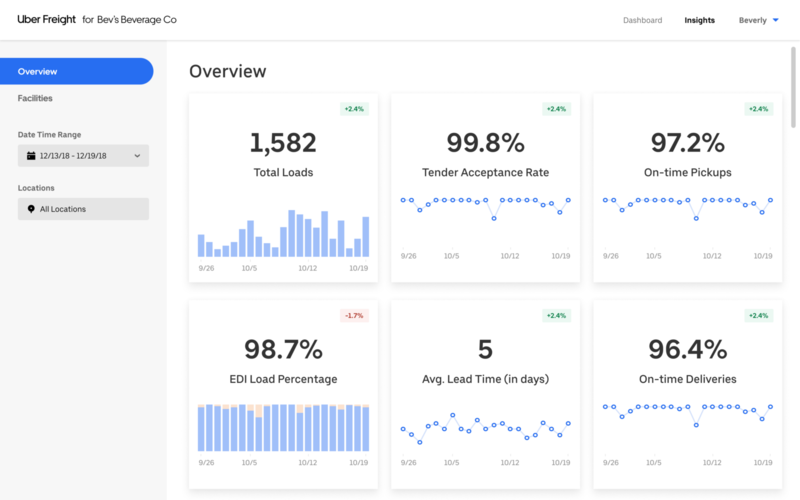 The dashboard offers insights in real-time (e.g., load information on a given day) and in aggregate over the long-term (e.g., drivers are spending more time at certain facilities). With access to this data, shippers will be able to quickly pinpoint problem areas and take action to streamline their operations. Uber Freight measures load-specific metrics, like tender acceptance rate and average lead time. We also measure facility-specific metrics, like load volume by facility and average time spent in each facility. 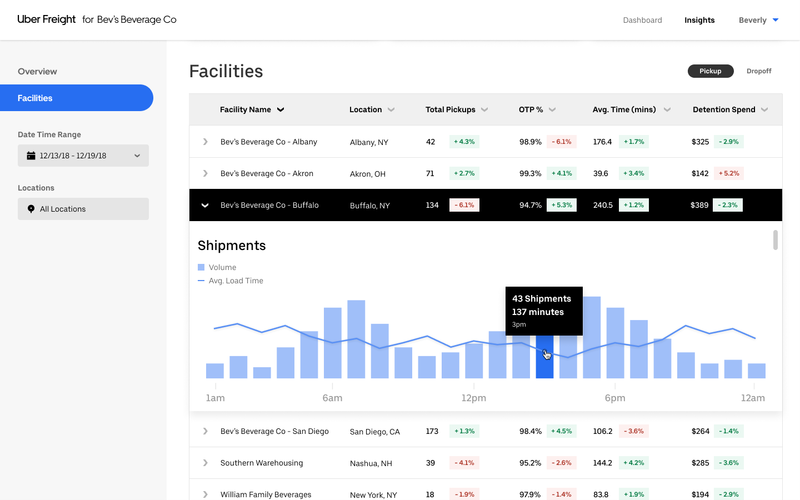 When a shipper logs in to Uber Freight, they will be able to view their insights, customized to identify and measure the metrics that are most valuable to them. With Freight Insights, we’re excited to bring another layer of transparency to shippers. The feature provides clarity to complex businesses, helping them streamline their supply chains and in turn power industry-wide change. The feature will begin rolling out to Uber Freight Shippers this month. To learn more, reach out to our team today.